There are three types of cards in the deck – gifts (gold), superpowers (blue), and benefits for world harmony (red) – in equal numbers. 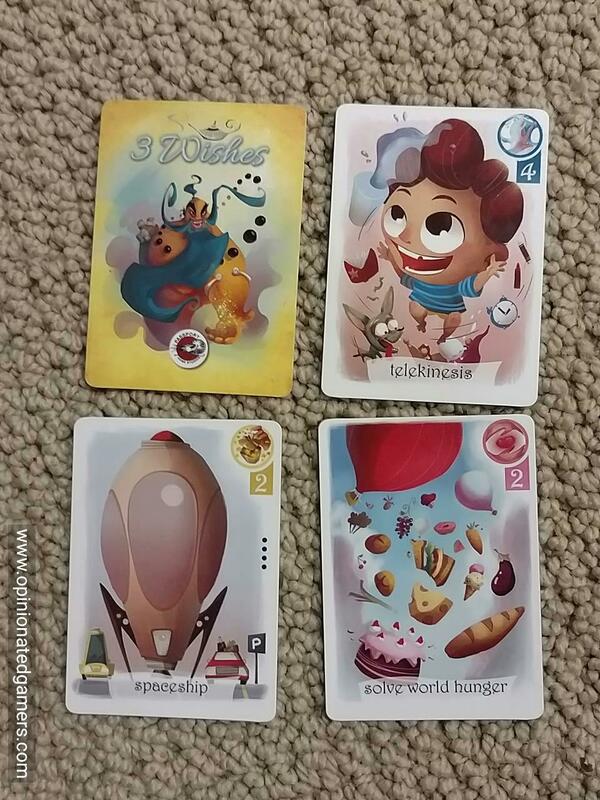 Most of the cards have a numerical value between 0 and 4, though there are a few special cards. The goal is to have the most valuable collection of cards, having one of each type in your hand, at the end of the game. The catch is – you aren’t allowed to always look at your hand! At the start of the game, the deck is shuffled and one card is discarded facedown back to the bag – it will not be in play this game. Each player is then dealt three cards – which are not looked at – and placed face down in a row on the table. The remaining two cards in the deck are placed face down in the center of the table. Now, each player may look at one of his three cards and puts it back in the same place. You may not declare the game end prior to their fourth turn in the game. If you take this action, it can be the only thing you do on your turn. However, as soon as a player takes the End Game action, the game immediately ends. 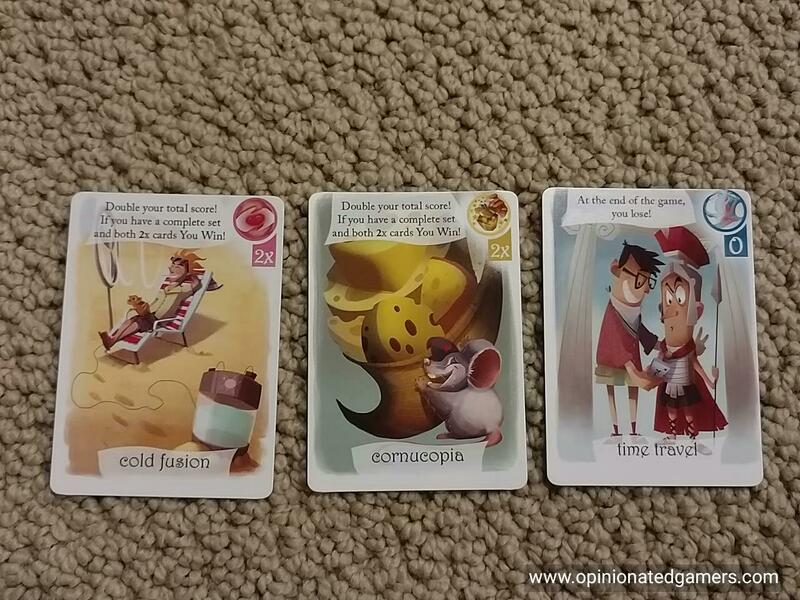 All players reveal the three cards in front of them. All players who do not have exactly one of each of the three types of cards are eliminated from the game; all players who do meet the criteria then total up their points. The base score for a hand is simply calculated by adding up the numbers on the cards. As I mentioned earlier, there are a few special cards though. One of the cards has a “0” on it, but it also has the text that you immediately lose the game. There are also two cards do not have a number on them, but instead have a “2X” marking. Each of these doubles the value of the other two cards in your hand. Additionally, if you have both of these 2X cards, you win the game automatically. The player with the most points wins. As the game is so short, the rules recommend that you play a series of games, and declare a winner when someone gets to 3 or 5 wins. 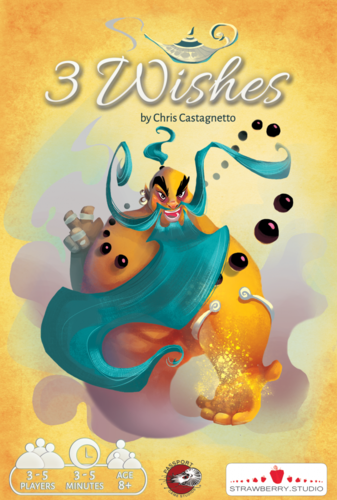 3 Wishes is a cute little micro-game. There isn’t a huge amount of strategy involved in the game, but enough to occupy you for the duration of the game. The biggest issue is that you will never really know what you have in front of you – you can only take two actions per turn, so you can only look at two of your cards at most on any turn. Additionally, your opponents can continually switch out your cards between your previous turn. Since you can only declare the game to end as the only action on your turn, you have to survive an entire trip around the board hoping that no one changes your cards – and that is a very unlikely turn of events! Therefore, you have to try to read the intents of your opponents and try to surmise what they have switched into your hand. This is a skill that I’m personally pretty awful at – but after playing this game a few times with one of my kids who is pretty good at it – I think there is definitely a skill to this game… one that I don’t have. This sort of guessing, read-my-mind game is normally not my sort of thing, but in a 3-5 minute package, it’s not one I’m against playing. I’ve had this in my pocket over a family get together for the holiday weekend, and it’s gotten a few plays in with the non-gaming family. It went over pretty well in that group as well. For a game that is not my style, I’ve played it 7 times over the weekend, so that is surely a point in its favor. I am not sure yet what Passport and NSKN plan to do with the game – I got an advance copy in a bag. This would be a nice microgame to add onto other purchases at the stand at a fair. This seems a good game. Great work.